Today was our last day of meetings. After completing the closing session, we rushed to the mountain. Faraya is the name of the village just below the actual slopes in Ouyoune El-Simane; however the whole area is located in Kfardebian village which includes the best equipped and most popular resort of Lebanon, the Mzaar Ski Resort. It is located one hour away from Beirut, the capital of Lebanon. It is around 46 kilometres north of Beirut. “Mzaar” is the Arabic word for sanctuary. The highest mountain in Ouyoune el Simane was called “jabal el mzaar” (mountain of the sanctuary) after a small Roman temple built on its top. It is believed that the Romans were using fire as signals to communicate between the coastal area and Baalbeck, or Heliopolis, through Faqra and the Mzaar peak. The temple was totally destroyed during the civil war (1975-1990) and its stones were stolen. Mzaar Kfardebian — formerly Faraya Mzaar is a ski area in Lebanon and the largest ski resort in the Middle East. It was founded in the late 1950s. There are 42 slopes and 80km of piste spread across three distinct valleys — named Wardeh, Jonction and Le Refuge – plus a number of ski schools and a wide variety of options for snowboarding, snow-shoeing, ski-touring, cross-country skiing and snowmobiling. The skiing season in Lebanon is similar in length to that of the Alps stretching over a period of 4 months. Ski season usually stretches from early December to early April. Skiing ranges between heights of 1,850 metres (6,100 ft) at Mzaar-Kfardebian, to 2,465 metres (8,100 ft) on the peak above Mzaar. On the top of Mzaar slope, upon exiting the chairlift, there is a view over the Bekaa Valley, Mount Hermon of the Anti-Lebanon and other peaks like Zaarour, Laqlouq and the Cedars. 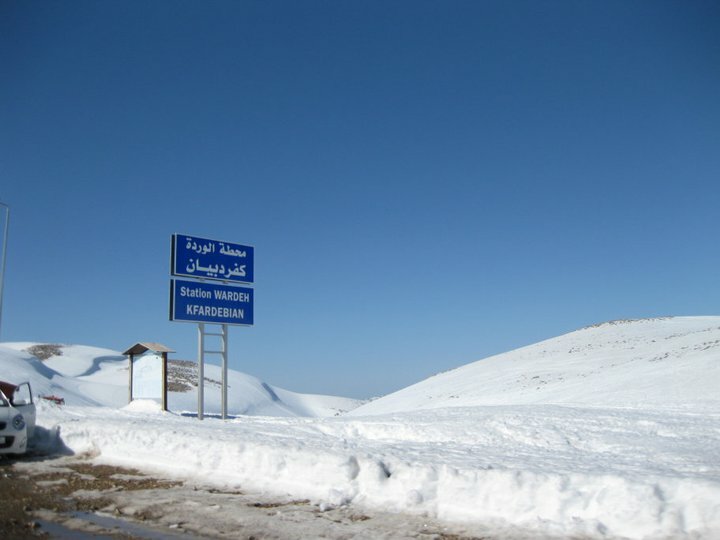 The peaks of the Mzaar-Kfardebian mountain range vary between heights of 1,913 and 2,465 metres (6,300 and 8,100 ft). The highest peak is Mzaar, followed by Wardeh and Jabal Dib (Mountain of the Wolf) Peak, offer challenges for the experienced skier or snowboarder. In winter snow accumulations reach more than 1.75 metres and temperature drops to −6 °C. It was a nice trip to the mountain. We spent some time there, had some snacks and pictures. Then we returned back to Beirut. Tomorrow, we are returning back to Baghdad. I will be missing nice climate, nature and people of Lebanon. I like this country and also this is the only country in the world where one can ski on snow in the morning and swim in the waters of the Mediterranean in the afternoon.